Sea to Summit Ultralight Mat. The Ultralight sleeping mat range has a single layer of medium resolution Air Sprung Cells™ to give you the lightest and smallest packed-volume mat without compromising comfort. These mats are ideal when going light and fast is your aim and getting a great night's sleep is essential for the next day's adventure. All Sea to Summit air sleeping mats come with a a repair kit containing six self-adhesive patches for repairing punctures in the field, a spare silicone one-way valve flap and now an Airstream Pumpsack. The Ultralight range features a single layer of Air-Sprung Cells™ for lightweight stability and comfort. 40D rip-stop nylon face fabric offers the right balance between weight and durability. Sea to Summit has pioneered the use of a liquid TPU lamination process in outdoor products. Common in the medical and aeronautical industries, it is vastly superior to the roll-to-roll film lamination process usually used in air pads. The TPU bonds better and more consistently than a film, virtually eliminating delamination issues. 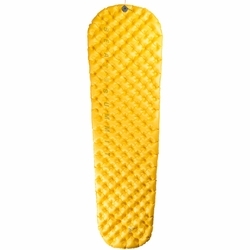 The Ultralight Mat has an R-Value of 0.7 and is ideal for summer use. All Sea to Summit sleeping mats come with an Airstream stuff sack, a repair kit containing six self-adhesive patches for repairing punctures in the field, and a spare silicone one-way valve insert. For extended storage, the mat should be laid flat, folded as few times as possible with valve open.